Claire and I are always interested in a deal, I received an email from Living Social with a special offer for a Sunday Roast at The Recreation Ground in Camberwell. 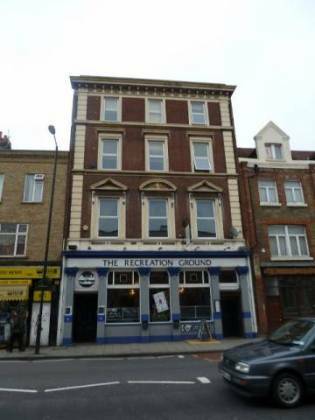 As we haven’t reviewed anywhere in Camberwell, I thought I’d take up the deal. As we drove up from Bromley, I needed to find somewhere to park. It was quite disconcerting, some parts of Camberwell are very nice, where as others are not quite so much… After driving round for about 5 minutes, I managed to park directly outside the pub, on the opposite side. Outside impressions were a bit mixed, the building itself looked quite good, but a bit of spray paint graffiti on the wall outside and a painted playing card on the window advertising Wednesday Poker night was off-putting. Going through the two sets of double doors, I was astounded with the very high ceilings. The decoration was quite sparse, with one brick wall and the rest covered with wallpaper. They had a table with various free papers and flyers. The pub / restaurant area was very open, with a couple of leather sofas, some arm chairs, 3 booths and tables dotted around. There was a large table on one side of the pub, with what looked like old school chairs. In the distance, I heard football on TV (I later found out that they have a separate area with a projector screen and a DJ booth). Walking up to the bar, they had a nice selection of spirits behind the bar, and the usual lagers on draught. I settled on blackcurrant and soda (I was driving), Claire decided on a glass of house red wine (which was enjoyable). Unusually, The Recreation Ground had jars of liquorice allsorts, flying sauces and milk bottles next to the rest of the bar snacks! I was very tempted, but we had a roast to get started. We were given some menus (on clipboards) and told to get a table. Looking over the menu, the Rare Roast Beef was £8.95, with “all the trimmings”. The waitress came over to take our order; Claire doesn’t like “rare” meat, the waitress was completely fine with ensuring it was “well-done”. I have no issue with rare meat so “as it comes, please”. A minute or two later, the waitress came back with dish of sea salt, cutlery and paper napkins in a cider glass. This is a quiet pub at 1pm on Sunday, with a couple playing snakes and ladders in a booth (they also had scrabble and connect 4). There were nice hanging chandeliers, an old-fashioned clock on one wall and quaint lamps dotted around. A large, gold framed ornate mirror hung on another wall. All in all, I liked the kitsch decor (Claire didn’t like the lamps – each to their own). In the background played some indy music. About 10 minutes later, our Roast Beef arrived. Whilst the portion didn’t look very large, it certainly seemed sufficient (especially considering the price). A couple of slices of beef each, roasted new potatoes (with their skin on), yorkshire pudding, long carrots, white cabbage and broccoli. Over the top of all of this was a thin gravy. Tucking in, Claire and I were both very impressed. The meat was to Claire’s liking and I was pleased to finally find a (recent) place that served Roast Beef to my taste. Claire was also very pleased with yorkshire, “best for the long time” were her words. Carrots and broccoli was nice enough (also, perhaps the broccoli was slightly overdone). Claire liked the horseradish sauce, it had a bit of a kick to it. I left the white cabbage – Claire, for once, could take something from my plate! Claire thought all the flavours worked, herbs made the meal. I personally thought it was also very good. Delicious and simple. The waitress took our plates and asked if we were interested in dessert. I saw on the menu previously that the puddings were £3.50, so I had to try one at that price! 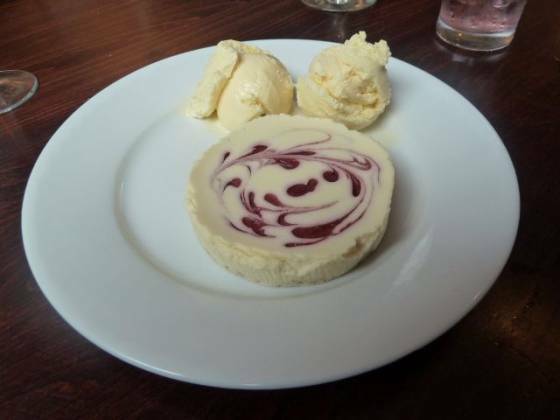 The options were White Chocolate and Raspberry Cheesecake or Chocolate Fudge Cake, both served with ice cream. I went for the cheesecake. To be honest, I wasn’t holding my breath, a dessert at £3.50 in this day and age and in London too… When it was brought out though, I was very surprised. I do not think it was homemade, but it certainly looked good and was a lot larger than most desserts at £5.50. There were also two scoops of ice cream and once again, delicious. So, to sum up. I haven’t tried any of the other Sunday lunches in the area, but the Roast that The Recreation Ground provide was excellent value for money. Claire would have preferred traditional roast potatoes, but the new potatoes were tasty enough. The meat was good (and they were accommodating with Claire’s request for well-done), and the yorkshire pudding was superb. I expected the gravy to be quite poor considering how thing it was – yes, I would have preferred more, but it was seasoned well. 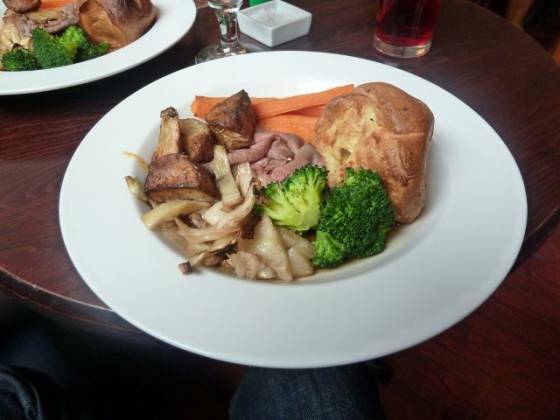 Overall, whilst it is not a classy restaurant and the food was simply, this was a good Sunday dinner and I would recommend trying The Recreation Ground out, even if you do not live locally.